The Emparro ACCUcontrol UPS module rounds out the high-performance Emparro power supply system. In the event of a power failure, it automatically switches to battery operation and prevents machine downtimes. Investing in a UPS system frequently pays for itself the first-time a stoppage is avoided. 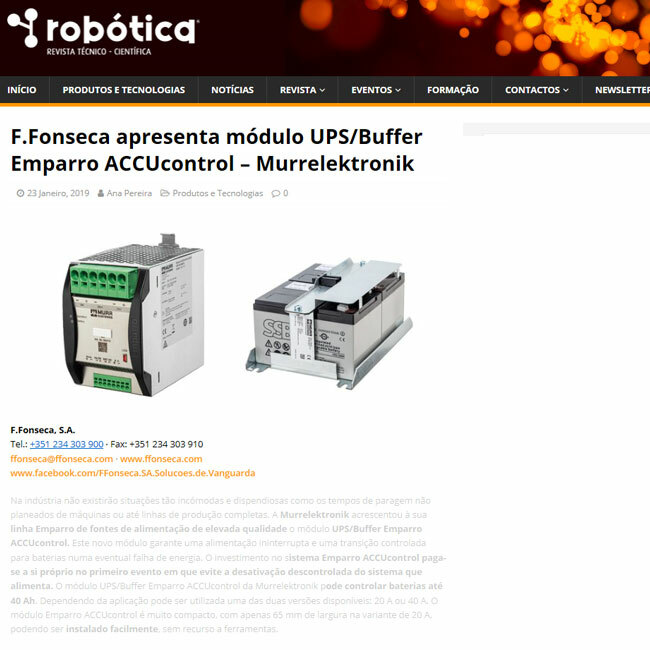 The UPS module is available for 20A or 40A systems. Emparro ACCUcontrol can be assembled without the use of tools and is maintenance free. Because it is only 65mm wide, the 20A model needs very little space in the control cabinet. Emparro ACCUcontrol permanently monitors the internal resistance of connected batteries. If limits are exceeded, the device gives a warning signal over an alarm contact. The battery replacement can then be scheduled for the next maintenance period. This predictive information prevents unplanned failures from happening and keeps you from having to send service technicians into the field for small jobs. Batteries perform better and they live longer in cooler temperatures. As a result, Emparro ACCUcontrol can charge batteries based on temperature. The charging voltage is adapted to the ambient temperature. This feature allows you to achieve maximum battery life, even in a high temperature environment. External lead batteries with a capacity of up to 40 Ah ensure a long-lasting bridging period.